WaveVR provides APIs for arena that developers can use to set up a round or rectangle range to inform limited movement range. Developers can choose round or rectangle mode and set up the diameter or width/length. Arena feature is not supported in editor mode. WaveVR provides 5 APIs for arena and ArenaTest.cs demonstrates how to use them. WVR_SetArena: Set the arena type and range. WVR_GetArena: Get the current arena attributes. 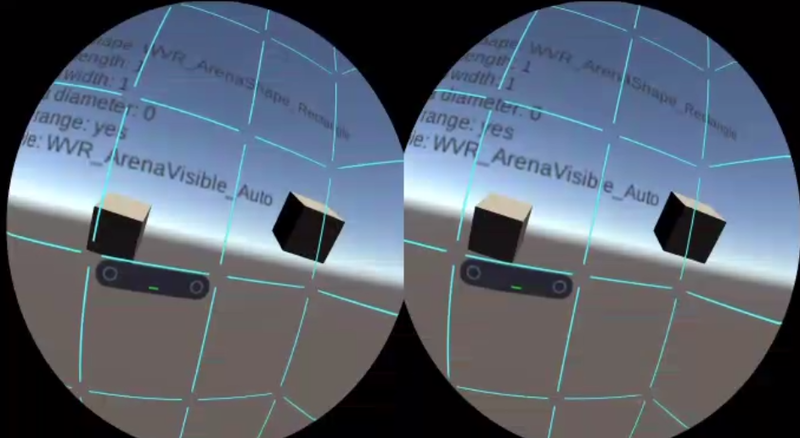 WVR_SetArenaVisible: There are three visibility arena modes: auto, on, and off. auto: Virtual wall is shown when a user is 30cm from the virtual wall. on: Always show the virtual wall. off: Do not show the virtual wall. WVR_GetArenaVisible: Get current visibility setting. WVR_IsOverArenaRange: Check whether the user is beyond the arena range.